A 24 year old male presents following a syncopal episode. On cardiovascular examination you believe there is a systolic murmur. Given his history and a family history of his father having a ‘large’ heart, you are suspicious of cardiomyopathy. How can you assess on clinical examination if the murmur is that of cardiomyopathy? I know most would say, lets echo, and I agree. Even better, I would take out my portable ultrasound and look at the heart. However, before you did this, what on auscultation of the murmur would make you suspicious? 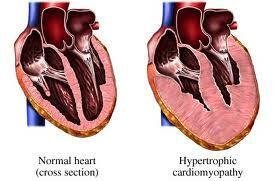 Hypertrophic Cardiomyopathy(HCM) can cause a systolic murmur. When the walls of the left ventricle are hypertrophied as they are in HCM, if there is less blood in the ventricle (ie., decreased venous return), the walls of the ventricle are closer together and the murmur is LOUDER. Decrease venous return by VALSALVA or getting the patient to STAND after squatting. When the patient squats, the venous return increases and the murmur should get softer, when they stand venous return decreases and the murmur becomes louder as the ventricular walls come closer together. To clinically hear the murmur, listen along the left sternal border. Be listening as you ask the patient to valsalva, then you hear the murmur increase in intensity in HCM. So you listen to the left sternal border as the patient valsalva’s and there is a loud murmur. There is high voltage in the QRS complexes and there are deep narrow Q waves in the Lateral leads. These are not ischaemic Q waves as they are <1mm wide. This are the classic findings of cardiomyopathy: high voltages and deep narrow Q waves in lateral leads.